One of my more successful attempts at encouraging my youngest son to pick up a pen and draw has been tandem drawing in my art journal. You know those super simple concepts that turns out to be surprisingly fun and effective? Tandem drawing is one of those. Plus, even if your child is not a reluctant artist like mine, drawing side by side on the same paper is an enjoyable way to spend some creative time together. 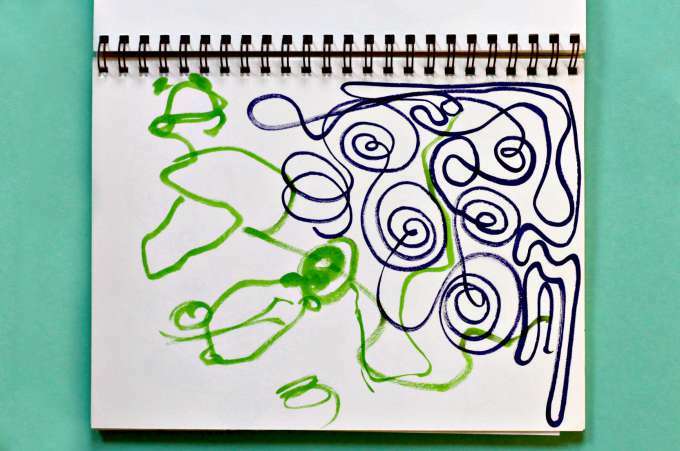 You may remember we did this recently with a coloring page, but this free form art activity also sparked his interest. Note: there are affiliate links in this post. If you follow me on Instagram you will know that I make working in my art journal a regular activity. I’ve shared before that I adore these mixed media vellum art journals. They are perfect for so much! I have a stack of them at home. 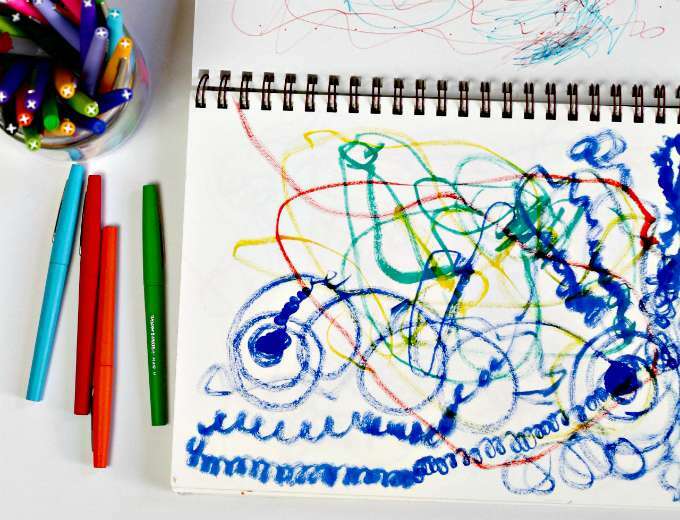 Most of the time, my scribblings are more design play than drawings and although my son rarely gets out his journal to sit next to me, he sometimes picks up a marker and tries to draw on my page. One evening, instead of claiming, “you may draw in your own journal, this is mine,” I decided to go with it and allowed him to start scribbling. I took my own pen and started following him around on the paper. This caught his attention and he went for it. 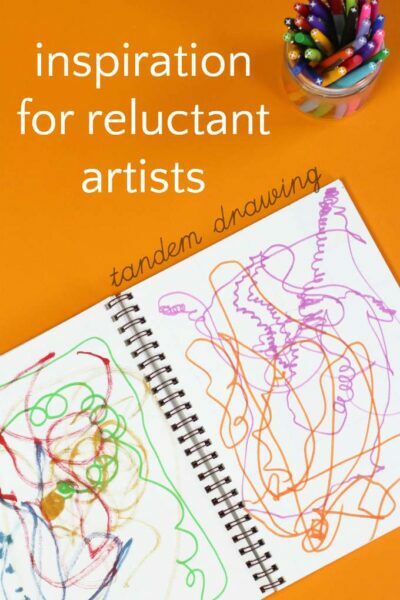 The activity reminded me of double doodle, which I saw recently on The Artful Parent, but our idea was more appropriate for my son who resists making representative art. 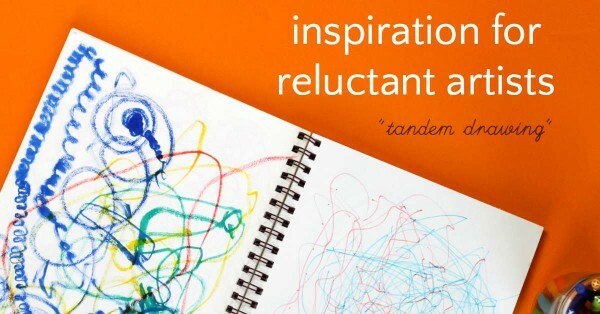 Switching up the art supplies can be an extra level of inspiration. I like Flair pens as a less-stinky alternative to Sharpies. I also let my son use my new favorite watercolor brush pens but these brush pens are a much cheaper alternative and we usually use them. Also try out oil pastels, crayons or paint brushes. We went on like this for several pages in my journal, and I must say it was quite a bit of fun. We chased each other with the pens, sometimes we mirrored each other’s movements. Sometimes we tried to interfere (in a friendly way) with each other’s drawings, and sometimes we just did our own thing. 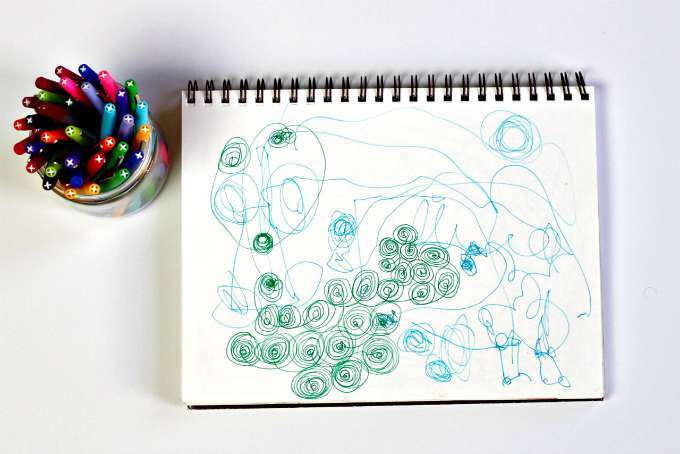 MORE: Tips for starting a creative journal with kids. Or find, all our EASY art activities here. Check out my art journaling on Instagram. You have such wonderful ideas!